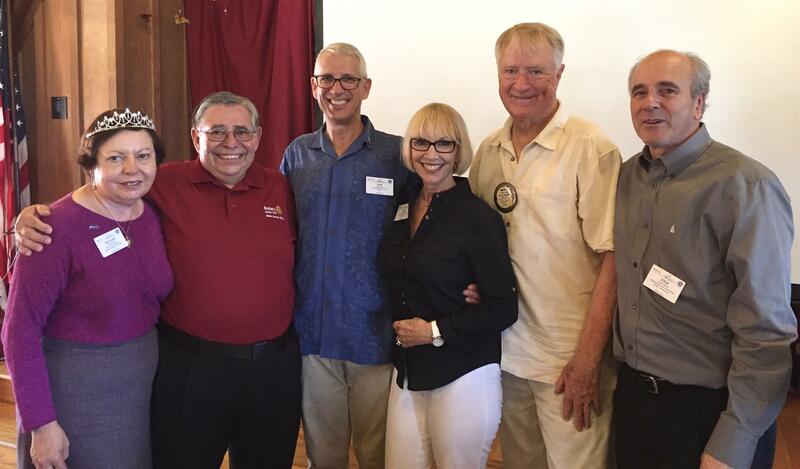 District Governor Mel Gallegos visited our club on August 9, 2018 to give a presentation focused on how members can open the door to Rotary for others. In 1990, Mel’s wife Judy (aka “Hey Jude”) became a Rotarian. When they were both attending a District Conference in Lake Arrowhead, Mel was asked why he wasn’t a Rotarian, too. Judy said: “He’s not qualified”, based on the thinking that Rotarians had to own their own business. At the time, Mel was working at Sharp Memorial Hospital- a business he of course didn’t own. But it was Lou Coviello who opened the door for Mel and let him see that he most definitely did qualify to be a Rotarian. The door opened further at the 1996 Rotary International annual convention in Calgary, Canada, when Mel realized the international reach of Rotary. There he met Rotarians from all over the world, and even though they spoke different languages, he found that they shared similar goals and ideas. Rotary opened the door for Mel to travel to Africa. In response to a challenge by the late Jack Campbell, a Rotary Club of Escondido member and polio survivor, District 5340 raised funds to sponsor a National Immunization Day in Eritrea in Africa. Mel was a member of the team that traveled to Eritrea to deliver the polio vaccine. This trip was the first of many Rotary-associated trips Mel and Judy have made to Africa. Mel asked us to think about who introduced us to Rotary and how we remembered them. He then encouraged us to think of people in our lives who we might be able to introduce to Rotary. Across the world, around 1.2 million people call themselves Rotarians. Yet that number has remained stationary for over a decade, indicating that we lose as many members as we gain. Moreover, most of the current growth of Rotary is in Asia. Therefore, Rotarians in the United States need to find new strategies to maintain and grow membership by inviting service-minded people to join us. To help cultivate new members in our district, the District 5340 website lists a number of resources and the August 2018 issue of The Rotarian features innovative ways to help prospective members see the value of being a Rotarian. Above all, Mel called upon all of us to keep opening doors for others and in turn help Rotary grow and flourish.